Many departure times for maximum flexibility. For 1 to 3 passengers, two children less than 30kg each can share a seat. Your quick and easy private flight. Total cost $290: - That is $145 EACH FOR TWO - that is $97 EACH FOR THREE. 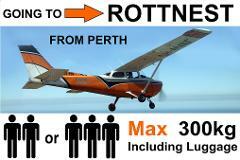 Fly Perth (Jandakot) to Rottnest Island. 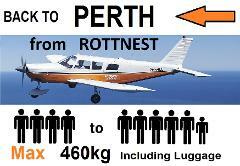 This INCLUDES your return ferry to Fremantle. Flexible dates in both directions. 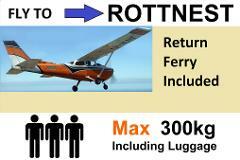 Total cost for 1 to 3 passengers $390: - That is $195 EACH FOR TWO - that is $130 EACH FOR THREE. Many departure times every day for maximum flexibility. Quick and easy! Six passenger seats. Two children under 30kg each can share a seat. $390 all up. That is $98 EACH FOR 4 or $78 EACH FOR 5. 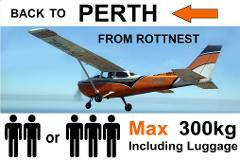 Fly Perth (Jandakot) to Rottnest Island. 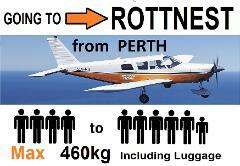 This INCLUDES your return ferry to Fremantle. Flexible dates in both directions. 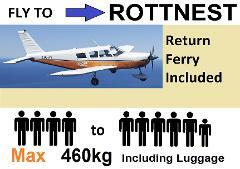 Total cost for 4 to 6 passengers $590: - That is $148 EACH FOR FOUR - that is $118 EACH FOR FIVE. A quick and easy flight back to Perth. Many departure times for maximum flexibility. Seats 1 to 3 passengers. Two children less than 30kg each can share a seat. Total cost $250: That's $125 EACH FOR 2 - That's $84 EACH FOR 3. Many departure times for your convenience. It is quick and easy! Seats 4 to 6 passengers. Two children less than 30kg each can share a seat. Total cost $350: - That's $88 EACH FOR 4 - That's $70 EACH FOR 5.